If you keep hearing about the concept of “shift-left” within IT service management (ITSM), and for the IT service desk in particular, then this blog is for you. It breaks down what it is and how best to successfully shift your IT service desk to the left. Shift-left for the IT service desk is the movement of IT support closer to the operational frontline and the end user/customer. It’s an ITSM strategy that requires changes to people, process, and technology – with knowledge management, self-service, and automation playing significant roles. Some Level 1 work can be shifted-left to Level 0 (an IT self-service capability), as could some Level 2 work. To achieve these, however, organizations need to appreciate that driving shift-left change purely to save money will most likely do more harm than good. For instance, an IT self-service capability that’s designed and delivered purely to save money will most likely not be used sufficiently to make a real difference to IT support operations or to deliver the expected financial benefits. 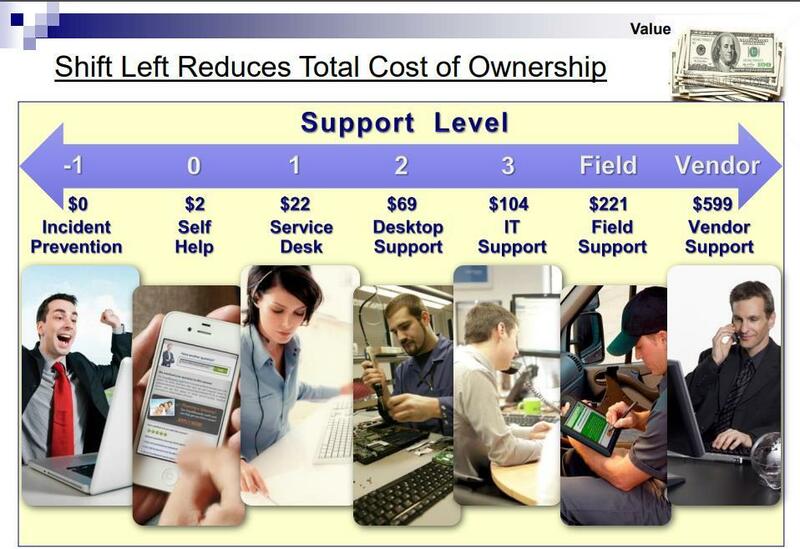 As already mentioned, shift-left can make a significant difference to ITSM and IT support operations. In particular, in the unit cost – i.e. the cost per ticket – of dealing with end-user/customer issues. With Level 1 support one-fifth of the cost of Level 2. Therefore, the more tickets that can be shifted to the left, the cheaper they are to resolve (or provision against). For example, a US$ 22 Level 1 “human” password reset versus a US$ 2 Level 0 automated password reset. Organizational change management (OCM). With a need to recognize that shift-left is a change to traditional ways of working and, as such, needs to be carefully managed from a people perspective. IT self-service. A fit-for-purpose self-service capability is the key customer-engagement mechanism for delivering shift-left benefits. It will struggle to deliver these without fit-for-purpose knowledge management and automation capabilities though (keep reading below). Knowledge management. The availability of fit-for-purpose knowledge articles and FAQs is a key factor for winning with IT self-service and thus Level 0 support. Automation. This is key in delivering the benefits related to both increased speed of resolution/provisioning and cost reduction. Plus, a better customer experience. So, a shift-left strategy is great, everyone wins. Or everyone should win – because there are, however, a number of barriers to cross, in addition to sufficiently investing in OCM, for real shift-left success. The biggest barrier to getting self-service – and thus shift-left – right is viewing IT self-service as a technology project rather than an organization change. Self-service is ultimately about driving a new way of working, and thus it again requires sufficient investment in OCM. You can read more about self-service success barriers here. Not integrating knowledge sharing with business-as-usual (BAU) activities. Failing to change performance measures to reflect the new way of working. Not recognizing that the value of knowledge sharing comes from knowledge use, not knowledge capture and storage. You can read more on getting knowledge management right here. 1. Investing in fit-for-purpose organizational change management, not only to engender the required people change but also to review how individual and team performance is assessed, recognized, and rewarded. This will help to ensure that people buy-in to the change as well as removing one of the biggest OCM-related issues – the fear of the unknown. Without this, your organization will struggle to adopt new ways of working related to knowledge management, self-service, and automation exploitation. 2. Making knowledge management a BAU activity that’s embedded within day-to-day operations. Knowledge sharing needs to be part of the day job, and not an add-on. Failing to do this will make knowledge sharing “something to do later” (and thus probably something that’s not done) – whether this is capturing knowledge or seeking knowledge as early as possible (when help is needed). So, add knowledge management activities – where they can add value – within existing, or improved, processes. 3. Aiming for knowledge exploitation over knowledge capture and storage – wherever possible leveraging proven knowledge management methodologies and techniques such as Knowledge-Centered Service (KCS) and Level Zero Solvable (LZS). This will prevent “wheel reinvention” and also ensure that your organization is benefitting from the successes and mistakes of those that have succeeded with knowledge management (and self-service) before them. 4. Focusing on employee wants and needs, not the available technology features. This applies to knowledge management, self-service, and automation. It’s not rocket science, it’s people science. People are more likely to use capabilities that make their life easier or that deliver a better experience or greater value. Thus, if the wants and needs of end users/customers are overlooked (in favor of delivering a technology-led solution), there’s a higher probability that new ways of working will not take hold. 5. Matching consumer-world capabilities in terms of ease-of-use and what can be achieved. As with the previous bullet, end users/customers will have expectations of how they should be working and of the capabilities made available to them. If these seem harder to use, old-fashioned, less reliable, or “less helpful” in other ways, then they are less likely to be used. Plus, there’s a need to embrace new technologies – as their usefulness is proven – to deliver further customer experience improvements and cost savings. This again applies to knowledge management, self-service, and automation. Has your organization successfully shifted-left? What learnings would you offer to others planning to do the same? Please let me know in the comments.